We at Geeky Hobbies would like to thank radiostatic for the review copy of Fuego! used for this review. Other than receiving a free copy of the game to review, we at Geeky Hobbies received no other compensation for this review. Receiving the review copy for free had no impact on the content of this review or the final score. In Fuego! you play as a group of armed animal bandits. Your objective is to rob the banks and the rival gang without being robbed yourself. Each bandit is armed with a different number of guns. Each gun fires one bullet that either destroys a bank allowing you to collect the gold, deflects off church buildings, kills the first thing that it runs into, or just flies off screen without hitting anything. 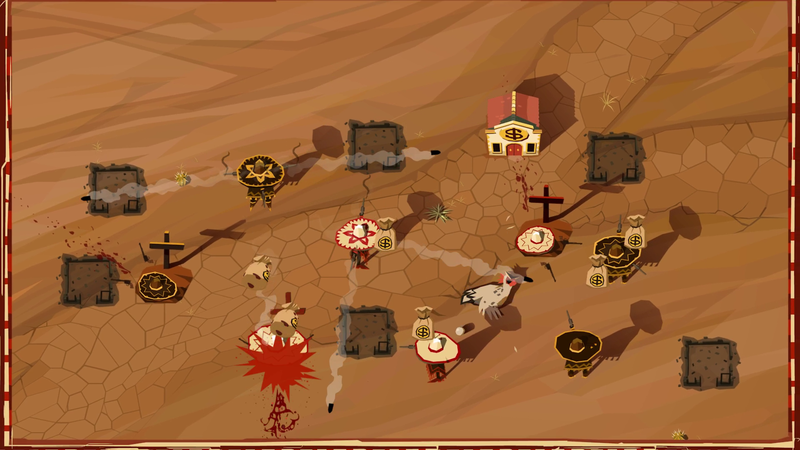 Each bandit has their guns in a fixed position and the bandits will shoot their bullets in those directions. Since multiple bandits will be competing for the gold at the same time, the game has rules to determine who gets to fire first. Firing order is determined by which character has the least number of guns. All bandits with one gun will all fire first at the same time. The bandits with four guns will fire last. Fuego! has two main modes: versus and puzzle. In the versus mode you and another player/AI will compete to see who can collect the most gold. In this mode both players get the same bandits and both players place them at the same time. After both players have placed their bandit their opponent’s bandit is revealed and both players then place their next bandit. Once all of the bandits are placed all of the guns are fired and the player who ends up with more gold wins the round. The other main mode in the game is the puzzle mode. In the puzzle mode the developers set up different challenges that utilize the game’s mechanics. Most of the levels involve collecting all of the gold in a particular level. Other challenges include destroying all of the buildings, saving all of the chickens, or creating a standoff where every single bandit is killed. When I first saw Fuego! in the Steam Store I was really excited to try out the game. The whole concept behind the game really looked unique. I don’t think I have ever seen a game before that plays like Fuego! When looking at indie games I always look for games that try to do something unique which is one of the reasons Fuego! really stood out to me. While the game sometimes relies a little too much on trial and error, Fuego! is an original and more importantly fun puzzle game. Despite the multiplayer being the bigger draw for the game, I am actually going to start with the puzzle mode since at this time I have spent most of my time with it. While some people might think of it as an afterthought to the multiplayer, I actually think the puzzle mode might be the best part of the game. The main reason I am enjoying the puzzle mode so much is that the puzzles are well designed. The mode does a great job utilizing the game’s mechanics to create some interesting puzzles where you have to think outside the box to find the solution. For example you regularly have to use your own bandits as cannon fodder just to block the enemies shots. This is showcased in a puzzle where you have all the bandits (including your own) die. In this puzzle you really need to think out which bandits have to take out one another. The puzzle mode has two small problems though. The first is that I wish there were more than sixty puzzles. Even though I haven’t finished them all yet I wish there were more to solve. The bigger problem is that the puzzles sometimes rely on trial and error. You can think through the puzzle but sometimes you just need to try out your solution to see what happens which will help you figure out what you are missing. This is not a bad thing since it is to be expected in a puzzle game like this. The problem is that it takes too long to reset the puzzle after you fail. I wish the game would let you just go back to your setup and adjust your bandits. Instead the game makes you wait through the entire setup for the puzzle. While this isn’t too long it gets kind of annoying when you lose a level multiple times because one bullet missed a bank by millimeters. Now let’s get to the multiplayer. While I haven’t played the multiplayer a lot at this point, I can see a lot of potential in it. Multiplayer matches seem to be really quick. All of your bandits must be placed within around a minute. While I wish the game would give you a little more time, I actually think the time constraint makes the multiplayer more interesting. You just don’t have the time to analyze all of your potential options in the short amount of time that you are given. You need to think on your feet which means that you probably won’t find the optimal placement but you won’t really care that much since the next game will start soon. I would guess that each match would take a couple minutes at max. The multiplayer’s continued success will depend on people continuing to play the mode online. While the game does include a practice mode against the AI, the AI is nothing special. I only played against the AI a couple times and the best the AI could do was force a draw which happened due to me totally missing one of the computer’s bandits. The AI is not stupid but I think it could have provided more of a challenge. Unless the computer progressively gets harder the more you play the game, I don’t see the computer being much of a challenge and you will tire of it pretty quickly. If you want to be challenged in the multiplayer mode you will have to play against other human players. While the controls work really well for the most part, I kind of wish that it was easier to adjust a bandit’s positioning after you have placed them. The problem is that after you place a bandit you can’t adjust them at all. All you can do is place the bandit again and rotate them to the position you prefer. I wish you could have just selected a bandit that was already placed in order to slightly adjust their position since this would save quite a bit of time. The artwork/theme of Fuego! is well done. The art style is simple enough to make it easy to see what you are doing but is designed really well. I don’t think the game really has much of a story since the puzzle mode seems to just be comprised of a bunch of random quotes. I want to bring up the fact that the theme of Fuego! may not appeal to everyone. The game does after all deal with Mexican Standoffs so there is killing/blood in the game. The game is not really graphic though since there isn’t a lot of blood and the characters mostly just disappear when they are killed. If the game had an ESRB rating it would probably get a E10+ or Teen rating at max. I doubt many people will have an issue with it but I wanted to bring it up just in case. At this time I have been playing the game for around four hours and I think I will get quite a bit more time out of the game. As I have already mentioned I have mostly focused on the puzzle mode so far. At this time I have probably completed forty to fifty of the sixty puzzle levels. I am guessing that the puzzle mode will probably last around four to six hours depending on how good you are at solving the puzzles. The game’s total length will come down to the multiplayer. If you really get into the multiplayer I can see spending quite a bit of time with it. At launch Fuego! retails for $9.99 which is a fair price in my opinion. Even if you never touch the multiplayer I think you can get at least five hours out of the game. If you play the multiplayer a lot you will definitely get your money’s worth. For the most part I really enjoyed Fuego! The game has an interesting concept that actually works well for a strategy/puzzle game. The puzzles are really well designed and make you think outside the box. While the AI is not really that challenging, you could probably get quite a bit out of the multiplayer as well. If you don’t like strategy/puzzle games or the concept behind the game doesn’t really interest you, you probably won’t like Fuego! If the concept interests you though I think you can get quite a bit out of Feugo and I would recommend picking it up either now or during a sale. A unique and fun puzzle game experience. Some of the puzzles are really well done. Sometimes relies pretty heavily on trial and error. The theme won't appeal to everyone.